Transylvania County Cooperative Extension is working closely with the Hemlock Restoration Initiative, Conserving Carolina, and the Transylvania Natural Resource Council to assist private land owners with the costs associated with treating hemlocks in sensitive riparian areas. 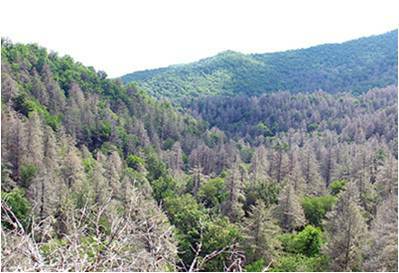 The Woolly Adelgid has already done significant damage to many forests. The hemlock woolly adelgid (HWA), an invasive insect pest introduced from Japan, has been destroying trees in Transylvania County since 2006. Without intervention it is extremely likely that most hemlocks in the area will die, with the largest and most valuable trees succumbing more rapidly. At this time, the only confirmed way to ensure that these trees survive is to chemically treat them. 10-15 years ago when the problem was initially identified, the cost of chemical protection was prohibitively expensive. Today treatments are a fraction of the original cost and need to be repeated less often. Are you interested in treating your hemlocks? If you qualify for this program and get your hemlocks treated, we will reimburse you for up to 50% of the total cost of the treatment with a maximum reimbursement rate of $2 per inch (diameter at breast height). Click here to see if your property qualifies for this program. The Land owner application page has step by step instructions as well. We hope you can take advantage of this unique opportunity to protect your hemlock resources by applying for participation in this cost-share program.